Does anybody believe that is the picture of an investor in the Chinese mainland stock exchange? He looks like a homeless guy who lives outside the stock exchange - asking for 2 RMB so he can buy a steaming pile of nothing. I forgot to mention something that happened in the most amazing and wonderful Cha-Mate that every person in China should visit ;) A few minutes after I ordered tea and cake, they dropped off a handy-wipe and a small cup of yellow-ish liquid - it looked like jasmine tea. I cleaned my hands and took a sip of the liquid, thinking I had mistakenly ordered a miniscule amount of tea. The liquid didn't have much of a taste - so I left the rest of it on the table. A few minutes later, somebody came by, said a couple things in Chinese, looked slightly confused, and then took away the small cup. Was it a finger bowl? Or a courtesy palate-cleansing tea? Or a mistake? I don't know!!! Here's a photo of a KFC sign in China. 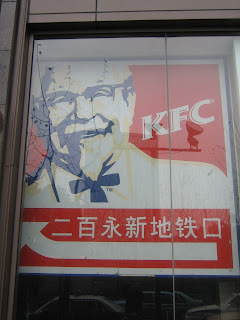 After a week here, the Colonel seems to be looking more Asian all the time. Maybe it was a botched facelift a la Kenny Rogers. Or maybe he's trying to keep up with his closest competitor General Gao. After packing, I was running a bit late for the airport, but I really wanted to try the subway and the MagLev (magnetic levitation) train before leaving. I would regret skipping them and twiddling my thumbs in the airport for 2 hours more than I would regret taking them and missing my flight :) Needless to say, it was totally worth the risk, even though I had to drag my luggage down several flights of stairs. Luckily I didn't buy any breakable porcelain china. 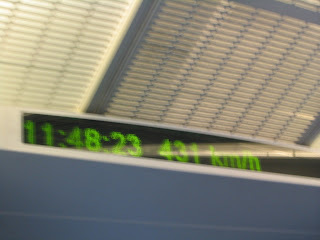 When the MagLev hit top speed of 431 km/h, I tried to take a picture, but the train was shaking a bit and there was some glare. 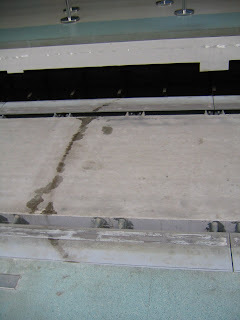 Anyway, engineers and train buffs may enjoy the picture of the track and the speedometer at peak speed. I also took a video of the train arriving and one of the speedometer during "take-off" - email me if interested. There is an interesting souvenir pricing system in the airport. In the terminal, after I went through security and everything, there are official souvenir shops selling e.g. jade Buddhas for let's say $45 USD. In the hallway just next to the shop, there's a guy with a table setup selling the same jade buddha for $100 USD. But if you're not late for your flight, you can haggle him down to about $60 USD. The official no-haggle shops seem to be a better deal, but if you don't know that, then you will haggle with the guy and feel like you saved a ton of money. All of this is silly though because the Yu Garden souvenir shops have the same jade buddha for about $50 pre-haggle and $20 post-haggle. And of course the sales people buy them for about $2 USD and the manufacturer makes them for $1 USD and the jade-buddha-factory worker gets paid 5 cents per buddha. anyway.... my point was about the Shanghai airport vendors. The flight was pleasant, I didn't get any sleep because it was still the afternoon Shanghai time, but I watched a couple movies, did some emailing, and caught up on some emails. Now I'm a little tired, missing Shanghai a lot, but enjoying being home. I can't wait for the next trip!